Since both Fork/Join and Akka start and stop their own thread(pool)s, the answer is: ‘it usually works, but it is not recommended within Java EE containers’. Unsatisfactory answer? You bet. But fortunately things may change with the next release of Java EE. However, standardization of application-facing, container-managed threading may be upon us. Work on JSR-236 commenced in 2003. Yes, that’s almost a decade ago. The first draft of the Concurrency EE spec appeared in 2006, but unfortunately it languished ever since. In April of this year, however, the JSR was resuscitated and an updated version was published last month. Even though the delta with the 2006 draft is minimal (e.g. ‘update package name from javax.util.concurrent to javax.enterprise.concurrent’), it is good to see things are back on the agenda. Similarly, ForkJoinPool can be parameterized with a custom ForkJoinPool.ForkJoinWorkerThreadFactory implementation that delegates thread creation to the ManagedThreadFactory. While trying to implement such an adapter I unfortunately ran into the issue that Fork/Join uses a custom Thread subclass (ForkJoinWorkerThread). This makes the task a bit harder, it’s constructor being package protected. And obviously I can’t test the code, since I’m not aware of any (public) JSR-236 implementation. Furthermore, I believe such adapters for java.util.concurrent should be part of the spec. No need to force application developers to reinvent the wheel again and again! When reading the JSR-236 spec it is clear that it was crafted in the ancient J2EE times. Just look at the code examples in the draft spec (EJBHome interfaces, really?). CDI is never mentioned, and neither is Fork/Join or other relevant newer technologies. Still, it’s clear that this spec will lay the groundwork for integrating modern Java concurrency frameworks with Java EE. But exactly how this will work out is too early to tell. 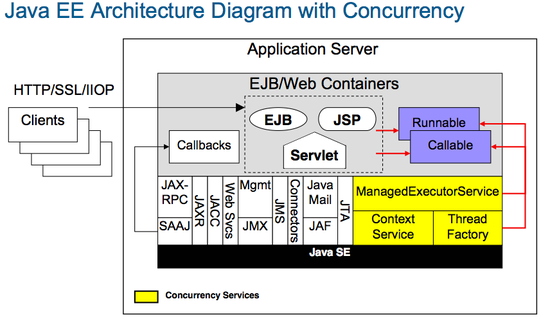 Another obvious candidate for using the javax.enterprise.concurrent functionality is the Batch Processing JSR. There’s lot’s of work to do it seems. Let’s hope that expert groups find enough time to join forces and move the Java EE platform forward.